I described the Lapeirousia project and my first sampling season (2016) here and here. It is, in synthesis, a biogeographical study looking at the geographical variability of Lapeirousia pyramidalis flowers (size, color, scent…) and DNA, and how this variability correlates with the variability observed in their pollinators. Unfortunately, the drought that has affected South Africa for the past few years is claiming its toll. The flowering season is late over all the Cape. Populations that exactly one year ago were in full bloom, this year are flowering late, poorly or not at all. 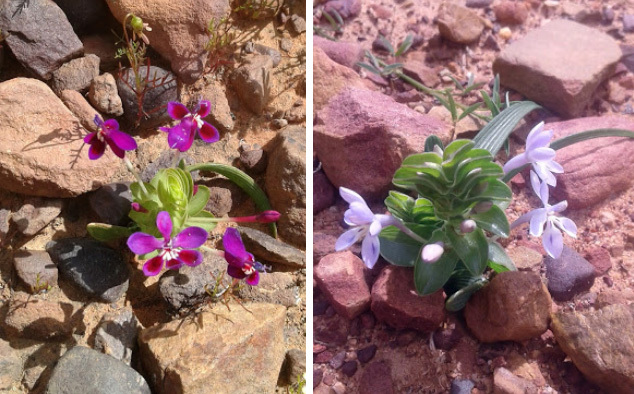 In some cases (particularly in Tankwa Karoo) the plants were not flowering at all, possibly saving the energy reserves in their bulb for the next wet season. All the tangible data that this 5619-km long trip yielded were twelve scent samples collected from as many flowers from three L. pyramidalis regalis populations. As a partial compensation for the frustration of not obtaining the data I was hoping for I got to meet some friends, enjoy Marinda’s tasty tangerines at the Kleine Schuur Padstall, sip the unique coffee served at the remote Tankwa Padstall with Hein, and listen to the silence in the beautiful emptiness of the Karoo.